1. 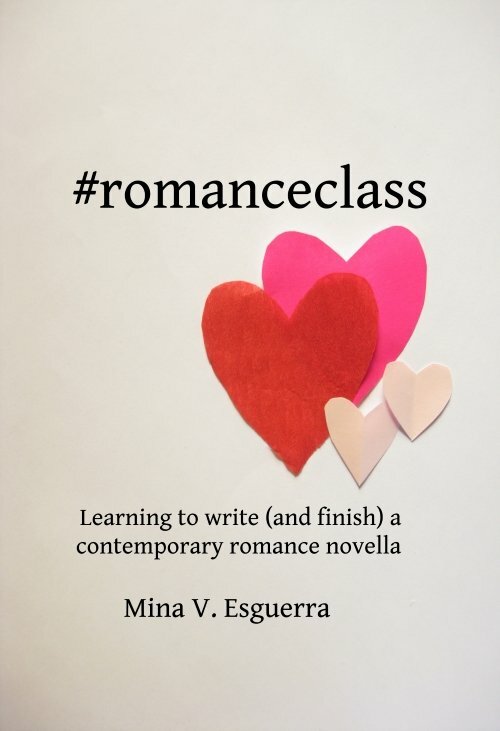 Buy and read a copy of the #romanceclass textbook. There are no print editions available in the Philippines. 2. Buy and read at least 3 of my books. Which ones? The ones that you feel will be helpful to you, based on the book descriptions. 3. Buy and read at least 3 contemporary romance books by Filipino indie authors, in particular the ones listed here: romanceclassbooks.com. Which ones? The ones that you feel will be helpful to you, based on the book descriptions. After reading all of that, and you feel that this is still something you want to do, then email minavesguerra@gmail.com with photos of your books and receipts. (There should be at least 7 books + receipts if you have everything. If you already have copies from before and lost the receipts, then photos will do.) Include in your email a short reaction to the books you’ve just read, and what you want the manuscript you’re writing for this class to be about. Please take the time to write this and make sure it shows a good grasp of grammar. As with my other classes, this is not a basic writing or grammar class, and I will not be taking on participants who need help in this area. You’ll get email confirmation soon after. And then…start thinking romantic thoughts. For research! For writing!